Come make Ka Hale Malie (the peaceful house) your own tropical cottage! Located 450 Ft from the ocean cliffs. It is located in Hawaiian Paradise Park in Keaau, HI which is centrally located to visit Volcano, Pahoa, and the new black sand beaches of lower Puna (Pohoiki). The cottage has one bedroom with a queen bed that has sliding doors to the back lanai (porch) for you to enjoy your coffee or your candlelight dinner. One bathroom with a (purified) rainwater shower that sprays from above and the side. A fully outfitted kitchen with gas stove, side-by-side refrigerator, built-in microwave, countertop convection oven, coffeemaker and all the dishes, pots/pans/soap/spices/olive oil/condiments/ice trays/wineglasses you could ever need. The attached living room has a vintage rattan couch and chair, a Sony flat screen TV, Roku streaming device with Hulu and Sling TV, a DVD player and sound bar, a library of over 50 DVDs (island themed! ), and WIFI. The house also has a front lanai (porch) with a table and chairs complete with an outdoor rug. The back lanai has an outdoor rattan couch, a rattan table and teak chairs, a tropical rug and some "party lights" for nighttime ambiance. The best hang out spot may be the covered carport which has been transformed into an outdoor rec room/tiki bar complete with tables and chairs, a BBQ with plenty of charcoal and a charcoal starter (uses newspaper, not lighter fluid, and gets coals going fast), a cooler, a rug ETC. The cottage is the only property on the 1/4 acre lot to give you privacy. Most days, and especially eves you can hear the crash of the waves on the cliffs, less than 500' away. Within a 5-10 minute walk is the beautiful coastline area where you can take a few chairs (I provide the portable ones in the bag), a few beverages and watch the sky and the ocean. During the humpback whale season you may see or hear whales. Rainbows over the ocean are a weekly event! Mahalo (thank you) for considering Ka Hale Malie and should you decide to come the cottage will welcome you! There are also masks, snorkels and fins; beach towels, paddle ball, frisbee, etc. for your use during your stay. If you want an island tour of any size/duration, I can recommend a great tour guide! I love the Big Island and especially all its magical places and wonderful culture and people. There is nothing like going for a snorkel in the turquoise waters of the tide pools, followed by wine tasting in the cool air of Volcano, followed by watching molten lava bubbling and glowing in the Halema`uma`u Crater in Hawaii Volcanoes National park! Not that I do that every day! Location, location, location, and it is adorable. Centrally located between Hilo, Volcano and lower Puna. The neighborhood is perfect for an early morning walk to the ocean cliffs to watch the sunrise or a sunset walk to enjoy the end of the day sky! 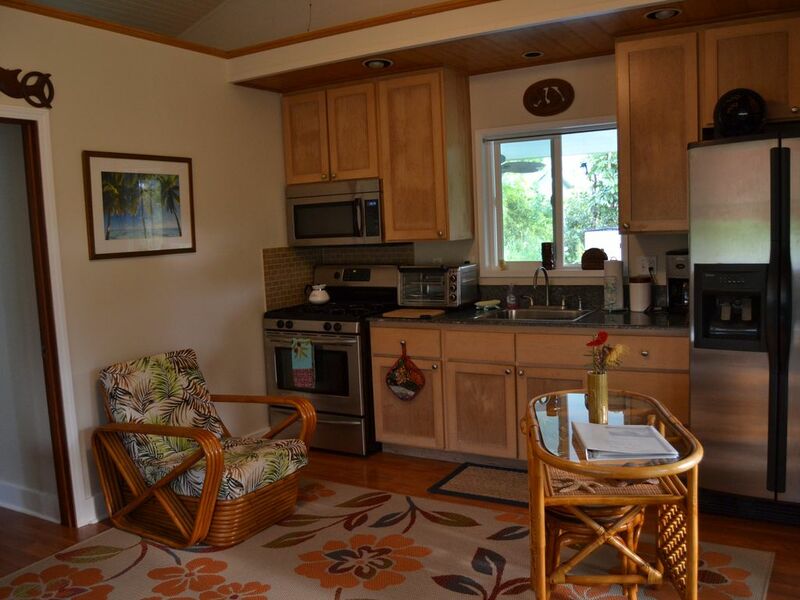 Located between Hilo and Kalapana with easy access to the best of the East side of the Big Island plus the cottage is small yet complete! Cute bathroom, complete with plenty of towels of all sizes, a shower with flow from above and the sides. Close to the coastline; able to hear the ocean! All the necessities provided including plates, bowls, mugs, glasses, wine glasses, margarita glasses, glass bowls w/lids for storage, electric citrus juicer, blender, etc. Small table w/ two chairs inside and many options for outdoor dining (front lanai, back lanai, rec area/tiki bar) with three other tables and at least half a dozen chairs. 32" flat screen w/ soundbar and Roku streaming with Amazon prime, Hulu, Sling TV, etc. Some island guides to natural history, geology, birds, fish, etc. Mask, snorkel, fins, paddle ball, cooler, binoculars. Over 50 movies (island-themed) including lava flow DVDs, surf films, comedies shot in tropical locales, a hula film, even South Pacific! Very comfortable, cozy, Well equipped and accommodating cabin. Perfect for two people. Enjoyed the lanai off of the bedroom. Cottage is supplied with everything we needed for preparing meals, doing laundry, relaxing, Very short walk to cliff overlook of gorgeous shoreline, and the road along the Cliffs . I am an artist and was inspired to paint and write every morning from peaceful Lanai . Very convenient for visiting beaches and volcano park to the south and southwest . A bit of a drive to Hilo, but we loved the friendliness and hometown feel of Hilo. We loved Pound’s restaurant, Ken’s, The Pineapple. Enjoyed Basucally Books, all the waterfront parks, the almost daily farmers market. Attended a guitar players concert at the old Palace theater & it was great . Lots of birdwatching. Beautiful parks to the north, especially Hawaii Tropical Botanical Garden. Cottage is surrounded by lovely palm trees and flowering shrubs. There was nothing we “needed“ that was not already in the house ! We would definitely come back here again ! Mahalo nui loa (thank you very much) David. I'm so happy you all enjoyed your time on the big island and in my cottage. I hope you do return in the near future! Aloha!! Nicely maintained property, everything was as it was listed. Loved the lanis, Kelly was very responsive to our requests and any questions we had. If your looking for a nice quiet home away from home this is the place. Mahalo Dennis; I'm glad you enjoyed it and the Ka Hale Malie (the peaceful house) lived up to its name! We really enjoyed the small, but comfortable house. Very cozy deck and furniture in the private back yard. A short walk to the ocean and watching the sunrise was memorable. A good supply of kitchen items was very much appreciated. Thanks for the memories! Thank you for staying at Ka Hale Malie and so glad you enjoyed your stay! I spent 3 months at Kelly's Air B&B in Keaau. The house is in a great location, just around the corner from the ocean, about 25 mins from Hilo and about 40 mins from the Volcanoes National Park. It's a quaint house with lots of privacy. You are lulled to sleep with the tranquil sound of the ocean. There are two covered lanais with nice views of the trees, great for watching all the beautiful birds while sitting and relaxing. The home has everything you need for your stay. Kelly is quick to respond to any concerns and the neighbors are very friendly. I would highly recommend this Air B&B. Mahalo nui loa Pam, I absolutely appreciate your review and what a wonderful and respectful guest you were. All my best! Both the indoor and outdoor areas are very nice and inviting. We had everything we needed, even a washer and dryer! The monthly rate is for 4 weeks (28 days) and monthly rates may not be available during peak (winter) season.